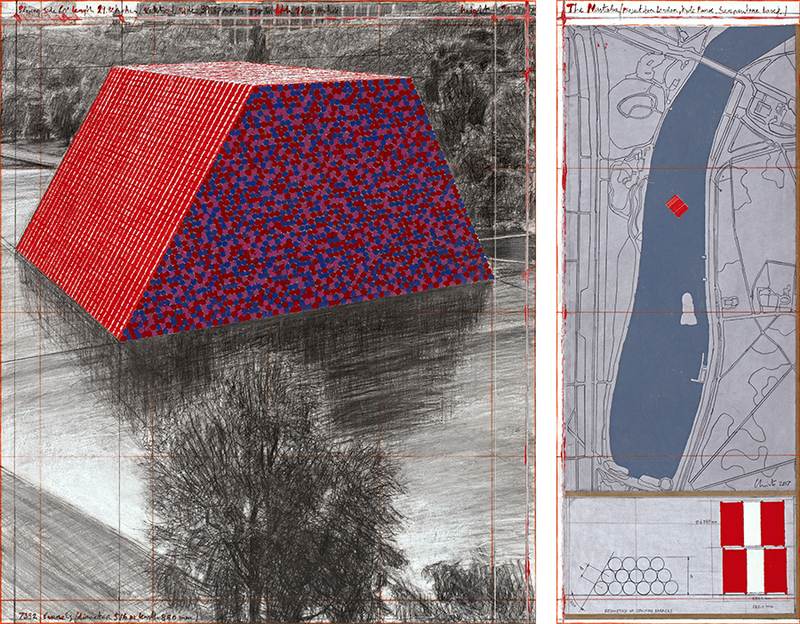 Christo reveals his first major British work, to float on Serpentine Lake. 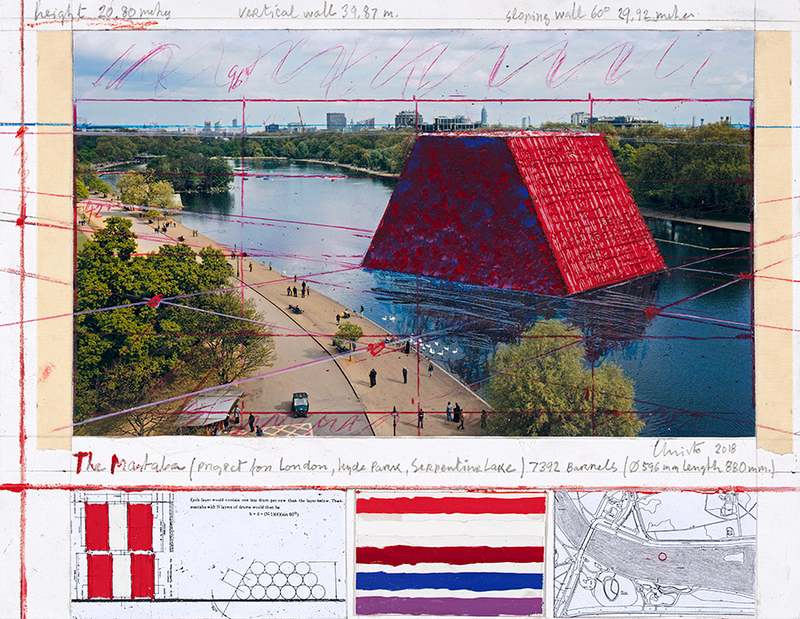 The Mastaba – Project for London, Hyde Park, Serpentine Lake (Christo & Jeanne-Claude). 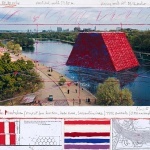 The Mastaba – Project for London, Hyde Park, Serpentine Lake (Christo & Jeanne-Claude). 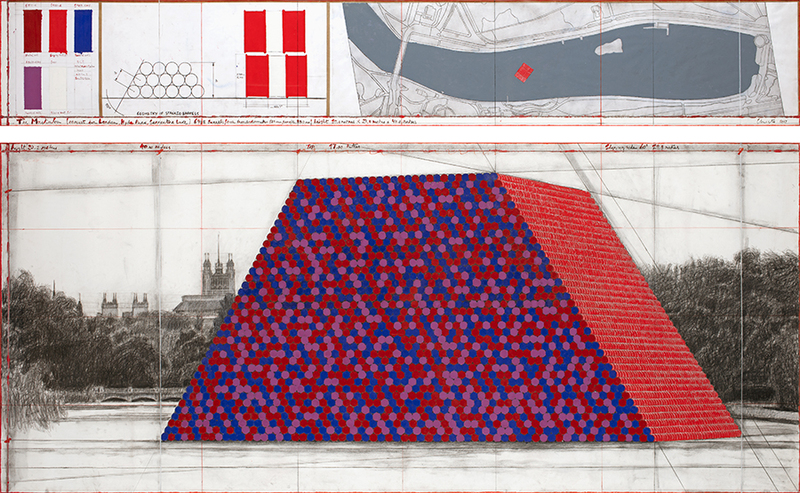 Aerial plan of The Mastaba – Project for London, Hyde Park, Serpentine Lake (Christo & Jeanne-Claude). 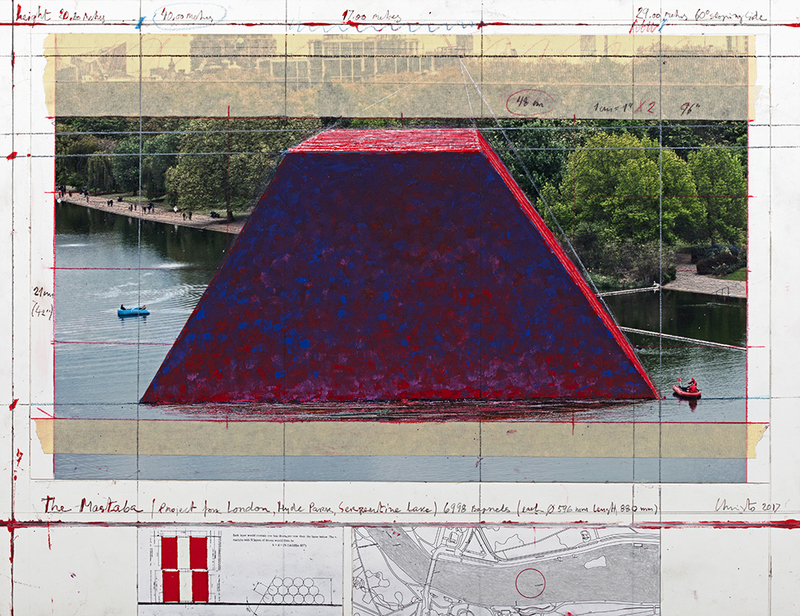 On April 3, the world-renowned artist Christo began construction of his first major public work in the United Kingdom, The Mastaba. 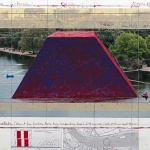 The stand-alone, pyramidal sculpture composed of 55-gallon oil barrels will be located in London’s Hyde Park, floating atop the park’s 40-acre Serpentine Lake. The temporary sculpture will be built by a team of engineers, and will consist of over 7,000 barrels placed over a floating platform. Rising at a 60-degree angle, the structure will reach a height of 65.5 feet with a 90-foot width at its base. 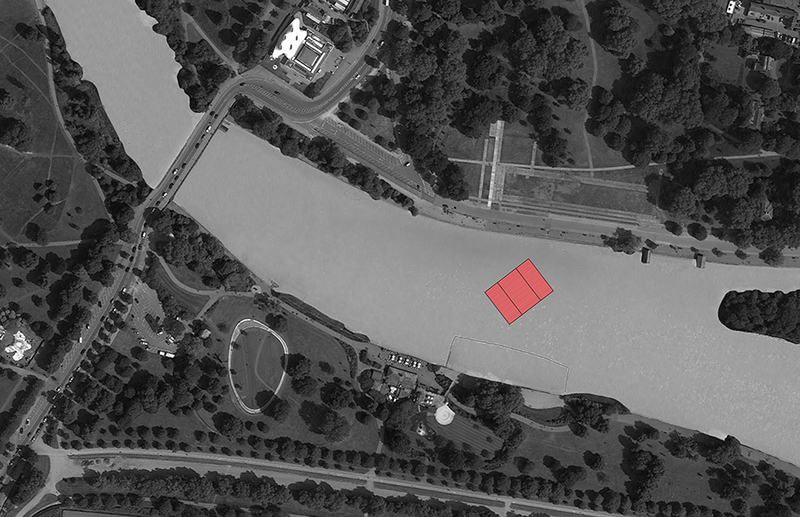 The base’s floating platform will be constructed of weighted, high-density polyethylene cubes. These buoyant cubes will support a steel scaffolding frame serving as the structural core of the 500-ton sculpture. 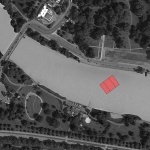 In terms of surface area, the footprint of the sculpture will be approximately one percent of the Serpentine. 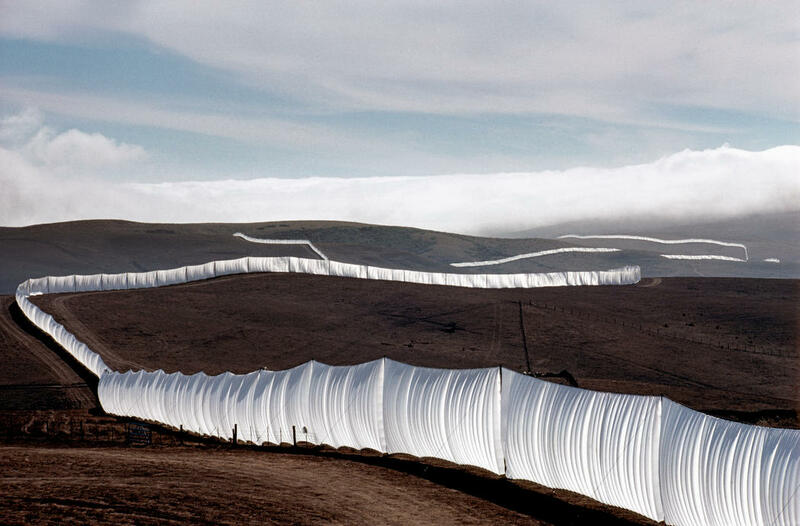 Barrels visible along the slopes and top of sculpture will be painted red and white, while those located on the two vertical walls will be a gradient of mauve, blue, and red. Following the project’s decommissioning, materials such as the oil barrels will be recycled for industrial use within the United Kingdom. 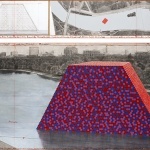 The project is influenced by Christo’s decades-long effort to create The Mastaba in Dubai, a speculative concept utilizing 190,000 oil barrels to create the largest, permanent structure in the world. 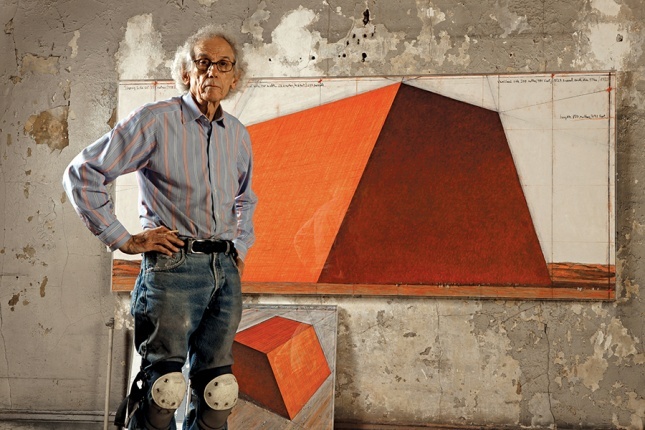 In a press release, Christo noted that the construction, maintenance and removal of his works is entirely funded by the artist through the sale of his original works of art, as well as philanthropic donations. 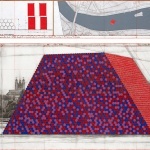 In tandem with Christo’s unveiling of The Mastaba, the nearby Serpentine Galleries will present its first exhibition of Christo’s decades-long collaboration with his late wife, Jean-Claude. 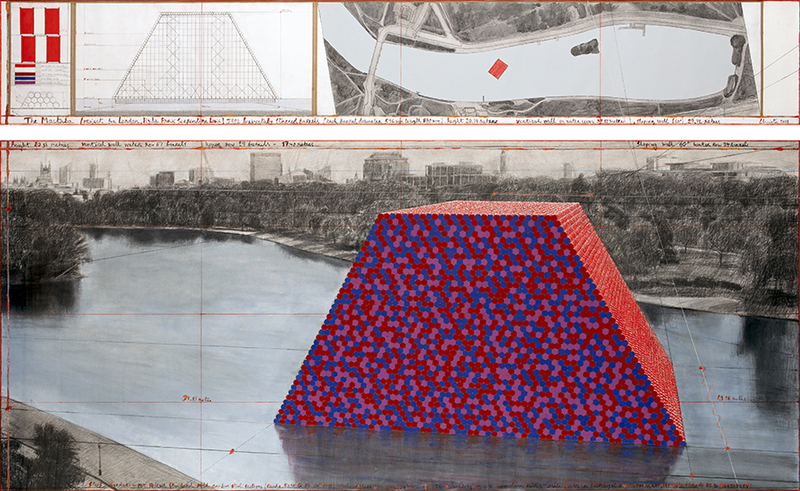 The artistic duo was known for their large-scale and public works. Past pieces such as Wall of Iron Barrels (1961) and The Wall (1998) similarly used oil barrels for massively scaled sculptures. 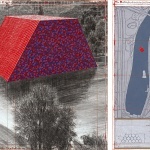 Public parks and natural landscapes figured prominently in their partnership, with Running Fence (1976) and The Gates (2005) contrasting and drawing upon their surrounding environments. Weather permitting, construction of the sculpture will be complete by June 18, with dismantlement commencing on September 23.